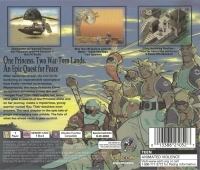 Box Text: One Princess. Two War-Torn Lands. An Epic Quest for Peace. After centuries of war, the two lands bordering an impenetrable swampland have finally reached an armistice. Mysteriously, the noble princess Elena Disappears somewhere near the war-ravaged front line. Distraught, her sister Nina goes in search of the Princess alone and on her journey meets a mysterious, young warrior named Ryu. Their destinies soon entwine. The next chapter in the epic tale of magic and mystery now unfolds. The fate of what lies ahead rests in your control. 11-25-2013 mark1982 Box Text One Princess. Two War-Torn Lands. An Epic Quest for Peace. After centuries of war, the two lands bordering an impenetrable swampland have finally reached an armistice. Mysteriously, the noble princess Elena Disappears somewhere near the war-ravaged front line. Distraught, her sister Nina goes in search of the Princess alone and on her journey meets a mysterious, young warrior named Ryu. Their destinies soon entwine. The next chapter in the epic tale of magic and mystery now unfolds. The fate of what lies ahead rests in your control. 08-10-2012 mkarasch Box Text One Princess. Two War-Torn Lands. An Epic Quest for Peace. After centuries of war, the two lands bordering an impenetrable swampland have finally reached an armistice. Mysteriously, the noble princess Elena Disappears somewhere near the war-ravaged front line. Distraught, her sister Nina goes in search of the Princess alone and on her journey meets a mysterious, young warrior named Ryu. Their destinies soon entwine. The next chapter in the epic tale of magic and mystery now unfolds. The fate of what lies ahead rests in your control. 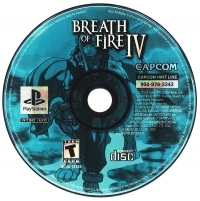 This is a list of VGCollect users who have Breath of Fire IV in their Collection. This is a list of VGCollect users who have Breath of Fire IV in their Sell List. 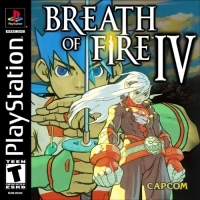 This is a list of VGCollect users who have Breath of Fire IV in their Wish List.